The White House and MASSnews collude to turn the first colonial mission to Mars into a hit reality show. What could go wrong? Plenty. "Mars Girl is fast-paced, insightful, inventive and very, very funny. Its vision of where the mutual dependence of politicians and media producers will end is both hilarious and a little frightening. " In this follow-up to Mars Girl, the Great Disaster has shrouded the earth and made food scarce but Barker and Cecilia stay in the north and try to survive with others who refused Washington's orders to move south. Without much choice, they join the Provos who have just seceded from the Union and declared themselves leaders of the Great Lakes States of America. 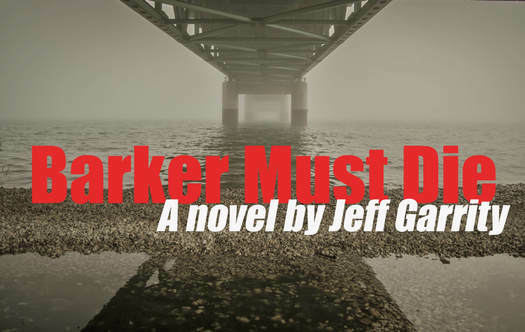 Another fast-paced ride into the future, Barker Must Die takes the Mars Girl story into a dark future where everyone’s looking for light and many are desperate enough to believe they see it. ​College freshmen Jeremy and Elaine meet at a party and slowly come together, until they're ripped apart by something that happens every day. Click on the title for a PDF. A married couple know it's the end of something, maybe even the world. Click on the title for a PDF. The gods of commerce expect a lot. On the trail of the orange-hared monster, Karl gets drunk, Jesus gets offended and Eleanor tries to keep the peace. The monster escapes, but not before the trio inflict some pain. Click on the title for a PDF of the script. Kind of like Carl Hiaasen, Vonnegut, and even Dr. Strangelove. It's an incredibly fast paced page turner. I read it in about 7 hours and couldn't get enough. I laughed, I cried, I chewed off all my nails. I'd like to send copies to all our media stars, producers and publishers of the 24 hour news cycle to shame them. Mars Girl is reminiscent of Kurt Vonnegut's early satire ... [It's] a bizarre, satirical romp that offers a glimpse into the media and politics of a future that is probably nearer than most would like to admit. A very well written and conceived view into what our future might look like if you follow the path of marketing sponsored content we're on all the way down the rabbit hole. A series of seemingly unrelated characters lives weave together as a mystery unfolds. Some crazy creativity to come up with all the intricacies in the various story lines not to mention the entire framework of the story. Part Tom Robbins irreverent humor, part Tom Clancy government intrigue with a bit of oh crap, Ruppert Murdoch took over the world. Ok, maybe more like advertisers took over the world. Great read that's a bit scary as you feel like this is a look into an entirely possible future that we're currently nibbling around the edges on. The first thing that comes to mind is: you better be working on the sequel! Mars Girl is an extremely fast-paced, action thriller taking place in the near future, without being too much of a science fiction story. I'm not a big SF fan. I love the way you write. I love the short chapters and frequent changes of focus, which make it very fast and hectic but not confusing. The story is interesting, very gripping, and after a while, one has to think about the role our media plays in the world of today. I really hope you keep on writing, and since I often grow attached to characters in books, I would definitely approve of a sequel. I read Mars Girl over 4 nights and yawned through each day afterwards. I couldn't stop reading, as I had to know what would happen next. When I found myself cooking dinner while reading this book, I knew I was addicted! I particularly looked forward to the chapters that were focused on Mirellen (Mars Girl). I laughed out loud at some of the images the author creates and I found some of the characters' quotes and behavior astonishing - very entertaining. If you don't laugh when you read Cecilia's views on religion, then Barker’s interpretation of which God is applicable at the time, I'd be surprised! It's so very entertaining and thought-provoking. Please write a sequel – I'll buy it. Great story line... engaging, interesting, and a little too close to what our future of a marketing and sales driven public life might be. The characters ring true - and reflect the disturbing society so nicely crafted by the author. Thought provoking and well done. Thank you for Mars Girl. I really enjoyed it and thought it was a great read. It has a scary (but quite believable) view of the potential future role of the media, with lots of humour too. I appreciated the parallels to what is currently going on politically with our media. This is a solid read. The pace and wit are both brisk in this alternate/near future story about the increasing, and increasingly open, influence of media in modern life. Compellingly written, Garrity's writing offers many authentic moments and details that put you in the story and in the lives of the characters. This is a promising first book. ​Mars Girl should make us all pay more attention to the threat of media manipulation of our world. Garrity's subtle wit and the fast-paced action make this a most enjoyable read. Jeff's humor provides lots of relevant cynical commentary about how "news" is created by and for the promotion of pretty much worthless products. Although not much about politics, it sure was prescient about the current activities, and results, of the major "news" organizations during this election cycle. I live in Michigan. I have visited many of the places the story explores. Obviously this adds some extra enjoyment.